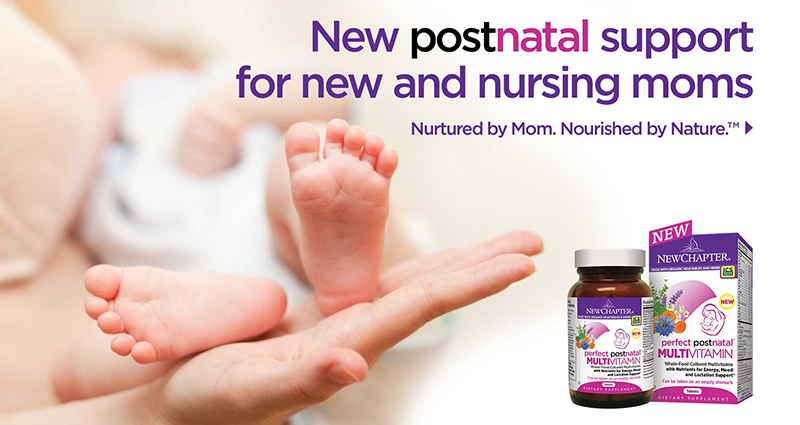 New Chapter Perfect Postnatal Multivitamin is formulated specifically for new and nursing moms. Perfect Postnatal Multivitamin is a whole-food cultured multivitamin with nutrients for energy, mood and lactation support. New Chapter Perfect Postnatal Multivitamin is made with organic vegetables and herbs. Nutrients for Breast Milk: Perfect Postnatal multivitamin is formulated with vitamins and minerals recommended specifically for breastfeeding women, including whole food cultured Iron, Vitamin B6, Iodine and Vitamin D3. Body Nourishing: To help address your body's needs after giving birth, Perfect Postnatal delivers whole-food cultured iron - required for blood cell production - as well as Folate. Energy & Mood Support: Whole-food cultured B Vitamins work naturally with your body to support energy needs during early motherhood and breastfeeding, while emerging studies suggest that taking a daily multivitamin can support a healthy mood and help with occasional stress and fatigue. Postnatal Herbal Blend: Perfect Postnatal features a complementary blend of botanicals traditionally used by breastfeeding women, including organic Oat, organic Turmeric and organic Chamomile. Gentle & Convenient: This multivitamin with organic ingredients helps busy moms get consistent nutritional support and can be taken anytime - even on an empty stomach. It's not surprising that in a world full of synthetics, millions of moms and moms-to-be are finding peace of mind by embracing the organic, whole-food cultured nutrition Nature intended. More than ever, you may be paying closer attention to the ingredients of the foods you eat. You're asking new questions, doing research online, and gaining new perspectives on what it means to nourish yourself and your baby. And you're increasingly aware of things you don't want in your body - like harsh chemicals, pesticides, additives, artificial ingredients, and GMOs. These new perspectives are why millions of women are deciding to become "New Chapter Moms". New Chapter invites you to discover more about their sustainable, whole-food cultured approach to vitamins and supplements and encourage you to embrace an organic, holistic health regimen throughout your life! From packaging and shipping to procurement and energy use, New Chapter strives to reduce their entire carbon footprint; it comes naturally to everyone who works there. Three tablets daily. Can be taken anytime, even on an empty stomach. Do not exceed suggested dose. Not recommended for use in children.